A very important opportunity has arrived for all the parishioners, relatives and friends who live continuously in the shadows of the Church of Steem. 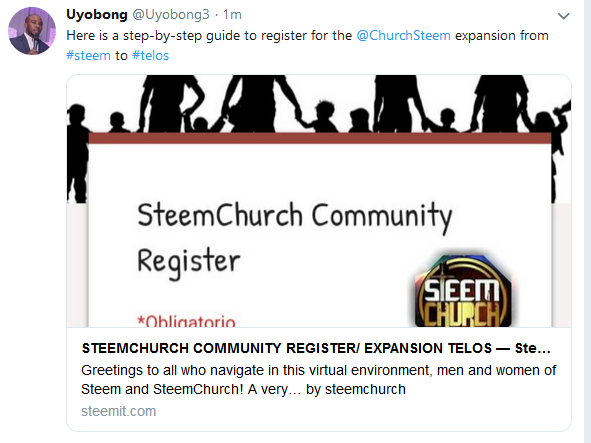 The Legendary @sirknight, has invested a number of hours, efforts, ingenuity and resources for the consolidation of the acclaimed EXPANSION STEEMCHURCH TELOS. It has obtained 3.2 million votes YES, in the proposal of Church workers. But not everything is rosy, some contrary winds always blow (836,000 NO votes), however we expect many more in our favor ... and 1.2 million SUMMARY. A focus primarily on the growth of our community through the reference system, which benefits those who assume the commitment to walk with us in the construction of an expansion and growth route. All these are exciting moments that you do not have to wait for another report, you can be the protagonist in this expansion! 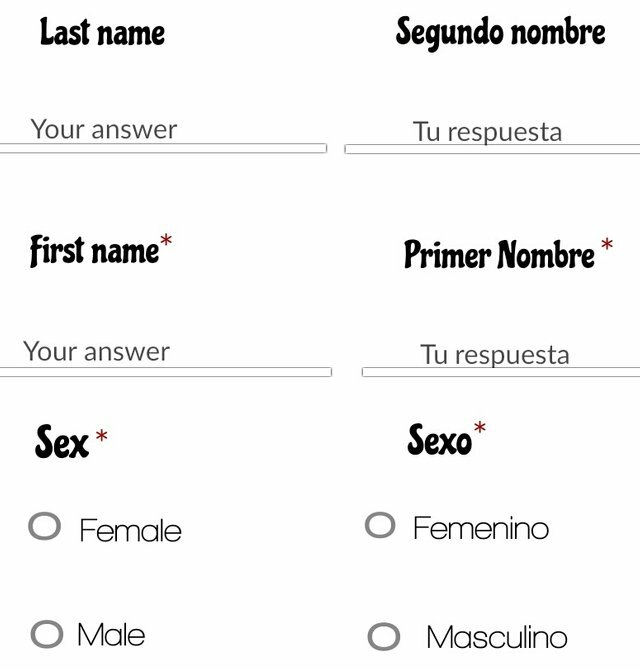 It is very easy to fill out the form, the following images show in English and Spanish, the steps you must take to complete the data. Now! Make sure to claim your Telos account, open the following link, register your data and any questions, contact us. 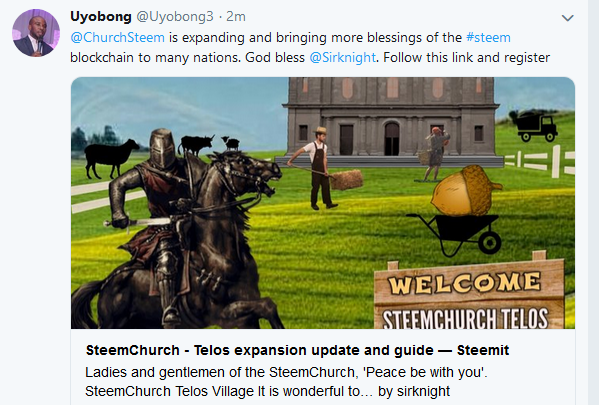 Visit the latest publication of @SirKnight for more details of our SteemChurch / SteemChurch expansion / SteemChurch Telos Village. We ask all Leaders of the parishes and communities of SteemChurch to provide support and information to all parishioners who wish to register. Please! And Jabez called upon the God of Israel, saying, Oh, if you would bless me, and enlarge my territory, and if your hand were with me, and you would deliver me from evil, so that it would not harm me! And God gave him what he asked for. Excellent your Grace, thank you. Thanks to you SK. You are a good example of work and perseverance. Thanks CEO for this timely guide on our mass onboarding to telos. I tried filling the form but had some difficulties with the captcha images. Thank you UY, good work to make known steam church... Certainly the cachas present some small inconveniences but, then it is solved almost automatically. Well noted , let us start the business now and refer family and friends . Thanks @jeanglou you are Welcome. Good evening dear friend and brother @emiliocabrera thank you for your great support. God bless you always. Thanks for this update! Registration is easy and it does not take long to fill it out. I urge everyone to participate! With faith that the proposal of workers will be approved. Excellent, God bless SteemChurch and all the work team, God give rewards for all the effort of SirKnight... Well explained brother @emiliocabrera. It will take me some time to learn from this community. Thanks for sharing. I hasten to know more about Telos, it sounds like a good platform. 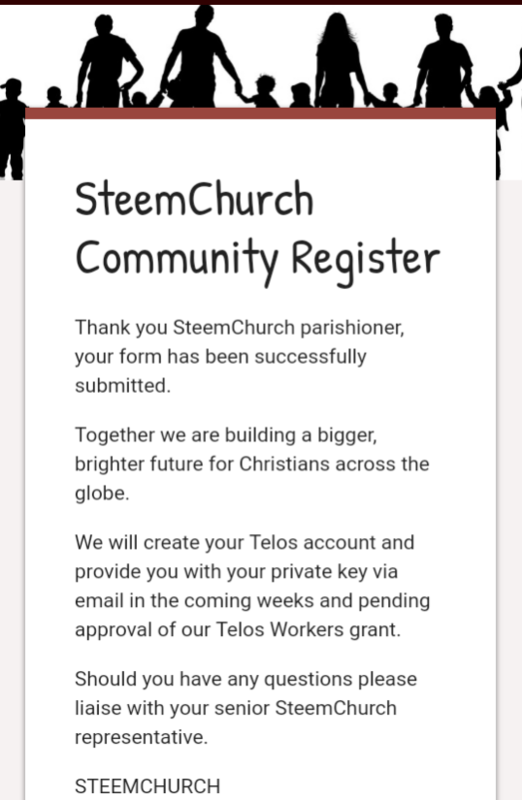 Thank you steem-church for this update. Thank you Carolina - we are all here for each other. Excellent message, thank you for this updates! Cool! Thank you for publishing the steps to the records. SteemChurch is great. Good instructions @steemchurch, with a view to the front and always optimistic of what lies ahead. Excellent publication @emiliocabrera. Great idea for the expansion and creation of accounts in telos. Thank you. We dream awake and live the good times, advancing in the expansion. Good teaching EC. United always in good causes.